CamPanel lets you keep an eye on many camera feeds at the same time. Use webcams or camcorders, directly connected to your computer or accessed via Internet or LAN. Motion alarms and video capture tools let you automate many surveillance tasks. Campanel was selected by Toronto CrimeStoppers as the surveillance software for their Community Crime Awareness Project. CamPanel allows for multiple recordings to occur at the same time from different video feeds into separate files on your computer's hard drive. The frame rate for recoding is also adjustable and the user is able to set a limit for hard drive space used. There is no need to change tapes or rewind/forward to find footage. Use the Surveillance Viewer to instantly access video and still frames by selecting date/time and sliding your cursor back and forth along the time scale at any speed. Multiple Cameras Onscreen: See all your camera feeds onscreen at the same time in a flexible grid layout. See four, six, eight, nine, or more cameras at the same time. Pan and Tilt: Control camera movement with optional TrackerPod® or PowerPod robotic bases directly from CamPanel. Motion Detection: Capture video to disk only when there is motion. You can individually set each camera to capture after a certain amount of motion has been detected. Color and Motion Tracking: CamPanel is the only software of its kind that can automatically move cameras to follow human skin tone or motion in the camera's field of vision when used with TrackerPod®/PowerPod bases. Pager and Email Notification: Have CamPanel page or email you when it detects motion on one of your camera feeds. FTP Upload: Have CamPanel upload still camera images to an FTP server automatically when it detects motion. 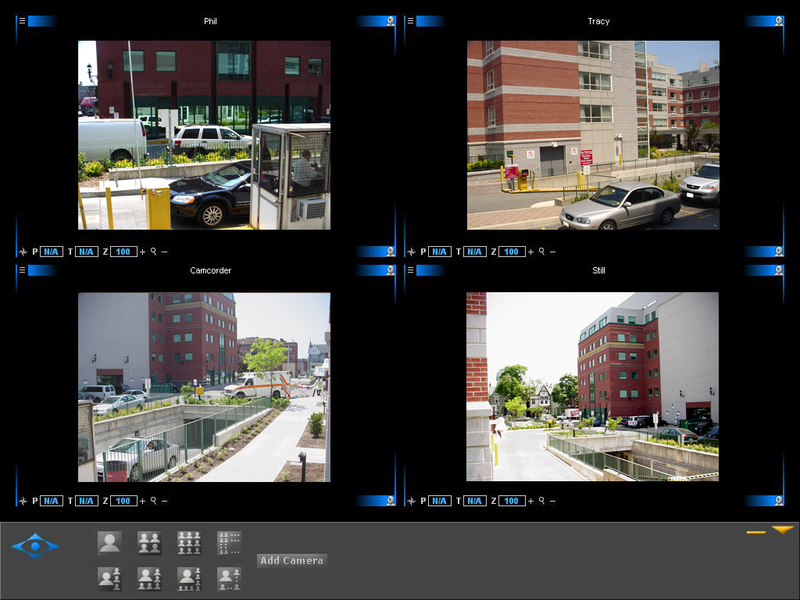 Remote Feeds: Integrate cameras located at remote sites and accessed via the Internet or a LAN. Video Capture: Capture video to your hard disk. Capture on a regular schedule or when motion is detected. Capture multiple streams simultaneously. Zoom Control: Control the digital zoom of all your cameras. Login Over the Internet: Keep an eye on things when you're away. View live video from your cameras or play back captured surveillance video. Sound Alarms: Have CamPanel play a sound to alert you of motion. Internet connection or a connection to a TrackerPod, MotorPod or PowerPod pan / tilt base. Cameras: The following types of cameras are supported: USB webcams, Firewire camcorders, and analog cameras connected to capture cards. You can connect cameras of different types to CamPanel. Using Multiple Cameras of the Same Model: There are special requirements if you want to use multiple webcams of the same model. There are only a few kinds of webcam that work well when more than one is connected to the same computer--most webcams confuse Windows if you use more than one because their drivers look the same to the operating system. We know of the following webcam models that work well: ADS USB 2.0, Watchport/V, Logitech QuickCam 4000 or Logitech QuickCam Pro 9000. You can purchase these cameras from our website. To use multiple analog cameras simultaneously, the capture cards you use need to be Hauppauge WinTV GO cards. Memory: 128MB of system memory minimum. 256MB recommended for 4 camera feeds or less. 512MB recommended for more than 4. Hard Drive: 20MB free space minimum. If you plan to capture video to disk, allow approximately 30GB per week per camera. Processor: 400MHz minimum. 733MHz recommended for 4 camera feeds or less. 1.4GHz recommended for more. Download CamPanel Software is free to try. TrackerCam®(TM) users who don't use the TrackerCam® Capture Driver may also want to try CamPanel, since it uses fewer resources. For the User's Guide, click here . Once you have tried out CamPanel, you will need a CamPanel license to activate full video capture. Your CamPanel license is activated by simply owning and connecting a TrackerPod® or PowerPod. If you don't have one of these, you can purchase a CamPanel license for $49.99.